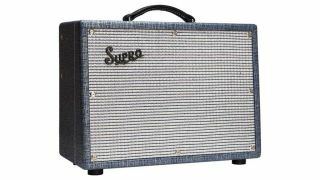 Supro has produced a host of top-notch tube amps in recent years, and now Musician’s Friend is offering a superb deal on one of its most compact offerings, the 1622RT Tremo-Verb. This 25W 1x10 combo is available for $649, which is half off its original list price of $1,299. A legit Class A design, this good-looking guitar amp packs four 12AX7, one 12AT7 and two 6973 tubes, and features onboard reverb and tremolo effects, plus a two-band EQ. The compact dimensions and low wattage make this one an excellent choice for recording sessions, as well as more intimate gigs. In terms of the biggest discounts on guitar amps this year, it’s unlikely much will beat this incredible price slash.